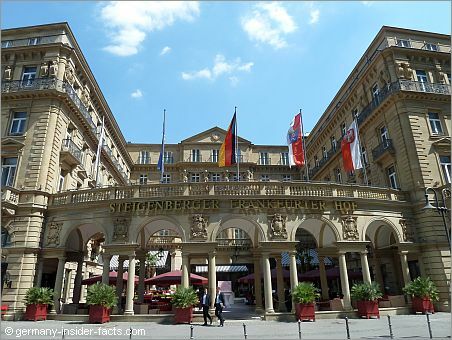 Steigenberger Frankfurter Hof is the most impressive grand hotel in Frankfurt. The historic hotel is centrally located and renovated to meet modern standards. Don't miss one of the best addresses in Frankfurt. Built between 1872 and 1876, the building was destroyed during WW II. Luckily, in the the early 1950s the hotel was re-built in its old glory. The stylish interior offers all modern amenities visitors would expect from a first-class hotel. 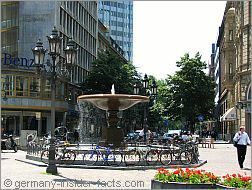 The location on Kaiserplatz (emperor place) is what fascinates all guests. The main train station is only 800m down Kaiserstrasse. An U-Bahn (underground) station is right at the front door. Shopping areas like the pedestrian mall Zeil, exclusive Goethestrasse and the gourmet mile Freßgasse are within easy walking distance. The old town with its major attractions (Römerberg, cathedral, museums) is really close to the hotel. It is in the old town where the attractive Christmas market is held in December. The 280 renovated rooms, decorated in different styles, are designed to make you feel at home. * Superiour rooms have either queen-size or double bed, full bathroom, desk, minibar, TV and WiFi. * Deluxe rooms offer a walk-in closet additionally. * 41 suites, from junior to large deluxe suites offer even more room and comfort. * Specials like best available rate and sightseeing/opera packages are available. * Check out the best deals . 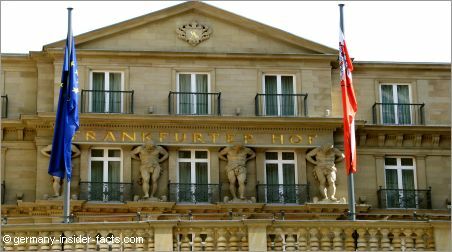 Since the early days, Frankfurter Hof has been a meeting place for Frankfurt's citizens, international guests and business people. * Restaurant Francais is awarded with a Michelin star and praise from restaurants critics. Patrick Bittner is the Chef de Cuisine whose creative cooking style has received recognition during the past ten years. The restaurant is open Monday to Friday from 12noon to 1:45pm and 6:30pm to 9:30pm. * Oscar's is a cafe, bar and restaurant with a casual atmosphere and innovative regional dishes. Open daily from 11:30am to 1am. * Restaurant Hofgarten invites guests with a Mediterranean ambience and a wonderful view of the inner courtyard. Open Monday to Friday 6:30am to 10:30am, on weekends until 11:30am. * For fans of the Japanese cuisine restaurant IROHA is one of the best localities in Frankfurt. Open Monday to Saturday from 12noon to 3pm and 6:30pm to 11pm. * Want to meet important people? The Autorenbar (author's bar) is not only a meeting point for authors during the Frankfurt book fair. The bar is a popular meeting point all around the year. Open from 9am (10am weekends) to 1am. A classy place with live piano music. * 18 conference rooms of different sizes, equipped with modern technology, for business meetings. * The hotel is a favourite to hold wedding functions and to celebrate other personal events in style. Frankfurt is a busy city. 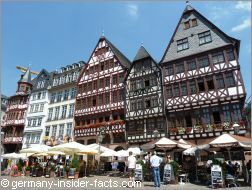 Especially during the numerous trade fairs many hotels in Frankfurt are booked up months in advance. Don't be late, use the box on the right to make your booking. I am really in love with this marvellous old building. Have a wonderful stay.